Free Primitive Camping included with the YOJam Weekend pass! YOJammers can camp for free in the Valley or in the Enchanted Forest! 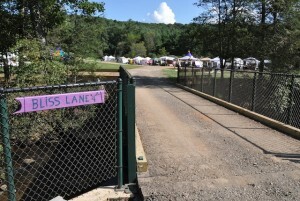 The Valley is a large, flat meadow, next to the creek, just a footbridge away from the Main Stage. No cars allowed, but it is worth the walk! Easy access to showers, music and fun! The Enchanted forest is a pine forest on the eastern side of the festival. Quiet and private, it’s the farthest walk, but worth it! Great spot to hang a hammock and chill out! This is the most primitive and secluded spot at the YOJam which will become more developed over time as our sweet little festie grows! Camp with your vehicle the YOJam Neighborhood! $25 Car Pass or $50 RV Pass. The YOJam Neighborhood is the closest and easiest access to everything! Just across the bridge from Blissland, Jamland and Red Rooster Coffee! Fresh Water, Showers, Ice and Potties just a stroll away. Worth the extra pass to be able to drive right in and start the party! Kids under 13 are always FREE! NEW!!! 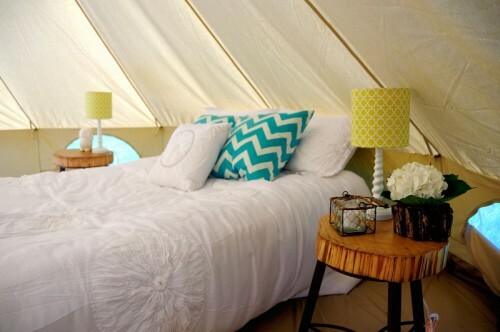 GLAMPING VILLAGE ON THE BLUFF! $725 only 12 Deluxe Tents Available! This is the most Glamourous Camping spot at the YOJam Party! Drive up to your very own tent, which we set up in advance and furnish with a double bed with real sheets! Table, chairs, lights and a welcome basket of goodies awaits the purchasers of these cozy spots on the Bluff! Over looking the Reserved Riviera and just a stroll across the bridge to Blissland! These special, reserved, tents will be labelled with the purchasers name and a YOJam assistant will be on hand to help you find your spot and get you settled in. This package includes 1 Car Pass and free showers! $600 each! Only 15 spots! This is the PRIMO Spot for the Floyd Yoga Jam!! In order to protect this beautiful creek we are limiting the number of spots available to only 15! These special, reserved, 20×30 spaces will be labelled with the purchasers name. 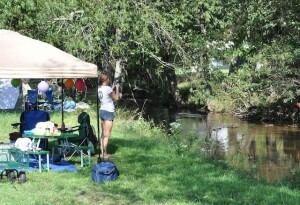 A YOJam assistant will be on hand to help you find your space next to the creek, just across the Bliss Bridge! Kids under 13 are always FREE! This package comes with 1-4Day YOJam ticket, 1 Car Pass and free showers! Invite some friends and fill the space with love. Please no soaps or additives in the creek! Limit only 1 car per reserved space and No RV or Pop-Ups. Extra friends with cars can park for $5 at the main gate or buy a car pass and camp nearby! 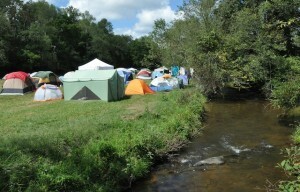 PLEASE REMEMBER THAT THERE IS PLENTY OF FREE CREEKSIDE CAMPING AVAILABLE IN THE VALLEY FOR JUST A SHORT WALK! REGISTER YOUR STUDIO AND WE WILL RESERVE YOU A CREEKSIDE SPOT FOR FREE! STUDIOS CAN PURCHASE 10 TICKETS and GET ONE FREE!